Posted March 6th, 2016 by Mobile Music School & filed under Music Lessons, Percussion Lessons, Piano Lessons. The students of Scoil Mhuire, Campile, are having great fun with Mobile Music tutor, Joanne, who is exploring the wonders of music with them in their ‘Learn & Explore’ classroom programme. 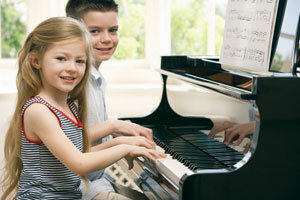 These interactive, fun and activity-based classes have given each of our students a firm musical foundation. It’s always a delight to see each child’s musical awareness enhancing as the programme progresses. During classes, students discover the story of music and explore the role of the conductor. Each class group investigates the importance of percussion, learning about dynamics, tempo, mood, the beat and rhythm. 2nd class love marching around the classroom to “Sally Go Round the Sun” and are always full of energy and enthusiasm. They were particularly quick to spot rhythmic patterns both visually and aurally in the rhythm game “Don’t Clap This One Back”. Meanwhile, 5th and 6th class have learned lots about the instruments of the orchestra. They explored the inside of a piano and enjoyed observing the piano being played in different and unusual ways, including with a violin bow! Over the next few weeks students will continue to learn and perform songs, as well as composing music using set sounds.